The Parliamentary election of 2012 never had the ingredients to be transformative, but it did offer the chance for the opposition to present a credible platform to the population – and seek to create space for issues to be debated that matter to the wider population. Ultimately there was a lot of focus within the opposition on discussions of boycott, and at election time on various election observation efforts, but less on credible campaigning and outreach. Some highlights did emerge in the margins of the campaign. Individual opposition figures and groupings emerged with more credit and reputations boosted. However, the lack of an opposition campaign on substantive alternative policies means that the opposition continues to be at the periphery of political life by default. Opposition political parties and groupings were split three-ways on their strategic approach towards the election – although there were nuances in the paths taken by the different groupings. Firstly, Just World and the candidates representing Tell the Truth and For Freedom declared that they were determined to maximise the opportunity provided by the elections and run full campaigns until polling day. Belarusian Social Democrats (Hramada) also ended up running candidates to the end of the campaign. A second group, headed by the United Civic Party, wished to use the legal opportunities to campaign, including access to TV and radio, by running candidates at the commencement of the process. However, they withdrew their candidate before early voting to protest against the unfair nature of the campaign. The Belarusian Popular Front, meanwhile kept one foot in this camp from the start, but only withdrew after seeing how restrictive the electoral environment was in practice. Other groups argued for a full boycott of the poll, including the Christian Democrats (with their leader Paval Seviaryniets remaining jailed) and the “European Belarus” movement around former presidential candidate Andrei Sannikov and Charter 97. United Civic Party (UCP) leader Anatol Liabedzka for a long time had a clear vision of his party’s strategy for the election – utilise the possibilities to campaign and then withdraw on the eve of early voting to protest against the unfair process and avoid “playing by Lukashenka’s rules”. With his strong conviction behind this approach, he was able to keep his party behind him through the process. Although he was unable to persuade the wider opposition to use this strategy, ultimately BPF did end up taking the same line. UCP also benefited from the simpler party candidate nomination process that had been introduced for this election, and were able to nominate 48 candidates, of whom ultimately 36 were registered. A certain game with the authorities then followed about whether the candidates would be able to use their legal campaign possibilities in the media with the authorities stating that calling for a boycott would not be allowed in TV debates or in their electoral platforms published in newspapers. In many cases – although far from all - compromise wording refraining from directly advocating a boycott, did however allow candidates manifestos to be published/broadcast. UCP ran a relatively active campaign on the ground, engaging with voters to persuade them why the boycott might matter to citizens. Critics argued that much of their publicity was due to an active press service, while their focus on the boycott meant candidates were diverted away from discussing the merits of their party’s platforms with voters and actively persuading people to support them. The Belarusian Popular Front (BPF) entered the election undecided as to whether they would stay in the race till the end – although there had been an earlier decision in principal to withdraw. The non-registration of many opposition candidates and the general restrictive environment and limited number of representatives in the election commissions persuaded them ultimately that they didn’t want to take part in what they perceive as a farce. As a result in a special congress on 15 September their candidates voted 42 to 2 to withdraw their 31 candidates who had been registered. Some candidates were more active than others, with in the regions Ivan Shega (Slonim 58) noted to have had a good campaign, and considered he had significant support in his district, but felt obliged to follow the party decision and withdraw. In the end, one of their candidates (Valery Koronkevich, Khotimsk 83) - decided to stay in the race as he was also supported by Tell the Truth, and chose to remain in the race with other candidates on that platform. Just World had entered the campaign with a determined focus to increase the name recognition of their party which remained low following its rebranding from the Party of Belarusian Communists in 2009. While they managed to register 29 candidates (of 34 nominated), they barely had any impact on the campaign (many candidates seemed to sink without trace). One of the main reasons for this was that the prime focus of the energy of party leader Sergei Kalyakin was on the “For Fair Elections” partisan observation project, and he himself was not running in the campaign. Some observers argue that one problem they face is that it appears to be harder for Left parties to obtain support from the West – although this can also be explained by low levels of activism. As a result, it has proven easier in recent elections to focus the energy of key activists on a properly funded election observation project instead as a vehicle to keeps its networks active. After the lack of a candidate in the presidential election, and ageing membership, the election can be seen as a missed opportunity. While Kalyakin remains an attractive personality, he has once again been unable to build on this to reach out to the wider population and build a strong movement behind him. One major area of cooperation for the opposition was the “For Free Elections 2012” partisan observation campaign where 14 political parties and civic organisations participated. This was led by Viktar Karnienka and Siarhei Kalyakin (of Just World) and saw party activists coming together to run a credible observation effort which included the deployment of more observers than ever before in Belarus. This was perhaps the most positive note of intra-opposition cooperation during the electoral period – with the campaign run under a unified message about why elections matter. This campaign included almost all of the major opposition groupings including Just World, Social Democrats (Hramada), Tell the Truth, Christian Democrats, BPF (officially but only worked in regions), UCP, Labour Party. Alongside “European Belarus”, For Freedom were the only major force to stay out of the campaign – ultimately focusing on their own Boycott 101 initiative - although some of their regional activists took part. From a political campaign viewpoint, one weakness of the partisan observation campaign was that they struggled to connect political life and elections to ever day problems and engage voters about why they should care about election processes. All too often they disregarded communications with citizens in favour of what they found more comfortable - more technical communications targeted towards political elite and media. Tell the Truth ran a professional election, focusing on door-to-door outreach and building on previous civic campaigns, which had focused on local issues. They supported 25 candidates who, officially as independents, sought registration by collecting signatures. Some of their best candidates, for example Mikhail Pashkevich (Minsk 95) were denied registration on the grounds of invalid signatures. Ultimately 13 candidates were registered and after an internal conference call discussion between candidates decided to stay in the race till the end. A number of these ran effective campaigns with professional campaign literature and seeking to engage with voters on relevant issues. An example was Yaraslau Bernikovich (Novopolotsk 25), who had suspended his BPF membership prior to the campaign. Highlights included handing out leaflets warning that basic food prices and utility rates were likely to follow the election, to support the candidacy of Tatiana Karatkevich (Minsk 97). Two party leaders Feduta and Dmitriev who were ineligible to run due to their post-2010 election sentence still took part in TV debates as representatives of registered candidates. Feduta in particular made a good impression, although Dmitriev did less well, being unable to answer questions about the major employers in the district he was campaigning on, and was criticised for focusing too much on the question of political prisoners. Overall, Tell the Truth came out of the election with its status confirmed as the most dynamic political movement in Belarus today. Some questions remain over their future, though. A long-term leader to replace Neklyaev remains to be found, while the grouping has yet to declare its ideological position on the political spectrum. However, with their high-level of grassroots activity they are likely to become a key component of the 2015 presidential election puzzle. For Freedom – The proposed candidacy of Alexander Milinkevich in (Minsk 109) suddenly and briefly returned him and his movement to the centre of the political stage. After deciding not to run in 2010 he was appeared marginalised in the Belarusian opposition movement – but had done his homework and identified an electoral district where public opinion was fertile for an opposition candidate. He seemed set to run a solid campaign with his candidacy set to provide the potential for a media focus. However, the district authorities chose not to take the risk and denied him registration on the pretext of invalid signatures – although some critics wonder if his campaign could have paid more attention to ensuring ‘perfectly completed signature sheets’. Subsequently the prime focus of the For Freedom campaign was on the Boycott 101 campaign (see below). Support to the independent candidate Andrei Yurkou (Gorki 82) was also provided by For Freedom, of which he is a member. His team was made up of a coalition of party branches and NGOs – the same group of activists who managed to elect an independent to the municipal council in the last local elections. He ran an active campaign and managed to gain significant awareness and name recognition in the electoral district. His official result was 20.5% of the vote, a higher figure than opposition candidates had received in previous elections in the district. Meanwhile, the high early voting figures of 38.5% indicate that the authorities paid particular attention to ensuring the ‘right result’ in this district. 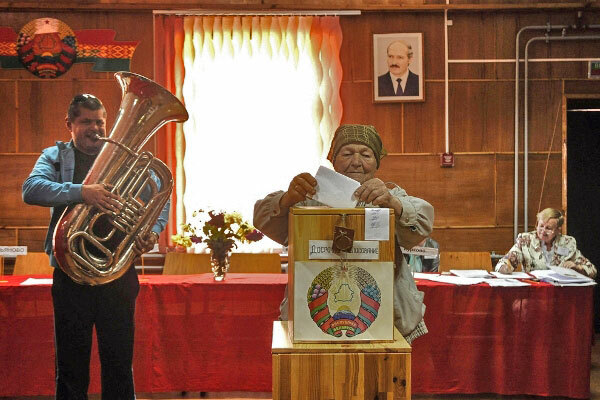 Another independent candidate Vital Karatysh (Luninets 13/Brest region) was also noted for an active campaign, and even in the official results obtained 58% of the vote in the polling station in his own village Kazhan-Garadok – and overall officially received 21%. One interesting development during the campaign was the decision of opposition groupings For Freedom, Tell the Truth, BPF, Just World and the youth group “Zmiena” to come together for a boycott based on one specific electoral district (Minsk 101). This Boycott 101 campaign was carried out in a district where a BPF candidate Artsiom Lava was registered, but who used his campaigning possibilities to advocate a boycott and withdrew before the election. The objective was to carry out a specific awareness campaign in the district and carry out a combined comprehensive effort to monitor the turnout in all the 33 polling stations in the constituency. According to the figures from the campaign, the final turnout was 35.69% while the official turnout was 58.8%. This was a slightly curious ad hoc grouping of parties, which included both those who were boycotting and running. While positively it did show collaboration across the ‘tactical divide’ – it also left parties open to criticism that they were providing mixed messages to the population. With the Christian Democrats decision to boycott the election, their party was largely adrift from the process. Rymasheusky still felt the need to draw attention to himself by criticising fellow opposition figures for running in the polls. In particular he was critical of For Freedom, Tell the Truth and Social Democrats (Hramada), who in a group of parties alongside BCD, had signed a joint statement in February 2012 declaring their intention to boycott if political prisoners had not been released before the election campaign. On election weekend, the Christian Democrats played a role in the various observation efforts, and had particular impact in highlighting the fraudulent increase in the turnout provided in the official figures, through a video that was taken by one of its observers in Polling station 594 in Minsk 107. This video showed the head of the election commission announcing turnout figures that were significantly lower than those in the final protocol. The results of non-participation in elections for the medium term prospects of the party are not yet clear unclear. BCD built themselves up as a party by running candidates in previous local and parliamentary elections, and there is a question as to whether by skipping these elections they have hurt the steady momentum built over the past few years. Additionally, their de facto leader Rymashevsky (while Seviaryniets is in jail) has emerged as the least disciplined and most contentious in the opposition, and is likely to hold back the party in the short-term. As for “European Belarus”, with Andrei Sannikov quiet and seemingly in exile, Charter 97 based in Warsaw, and the Free Theatre in London – their combined movement played little active or constructive role in the election campaign. Indeed, their presence was reduced almost entirely to on-line vociferous agitation for the boycott. Their sometimes collaborator Ivashkevich of the “Belarusian Movement” was also barely visible. This was perhaps a sign of their diminishing importance in country, with their future strategy is likely to be to call for a boycott of ‘everything/the regime’ – partly based on their exile situation where they are unable to really influence anything in the country. Another party who came out of the election with some credit, albeit in a haphazard way was the Social Democrat Party (Hramada) of Iryna Veshtard. As an example, one of their candidates Igor Maslovsky had the highest number of votes amongst opposition party affiliated candidates in Brest region. The party had been indecisive about whether to stay in the race, and with their recent registration problems overcome, if more focused from the start they could have used the opportunity to promote themselves more publicly – drawing on their comparative advantages, especially with a female leader offering a refreshing alternative in the opposition ranks. Another person who seemingly has eyes set on 2015 is Uladzimir Matskevich, the head of “EuroBelarus” NGO consortium. He is recognised to have political ambitions and did not miss the opportunity on the eve of the elections to criticise his potential opposition rivals arguing it was “high time to replace selfish and short-sighted opposition leaders” – clearly with himself in mind. Currently it is convenient for him to remain safely as a “civil society” leader and criticise the opposition, supposedly from the side. However, if he wishes to enter opposition politics transparently, he will need to build bridges and take risks and open himself up for public criticism by running in elections. Other smaller opposition groups also submitted candidates, but had little impact on the campaign. These included Vladimir Navasiad, leader of the Party of Freedom and Progress ran in Minsk 94, the Labour Party of Alexander Bukhvostov had 5 candidates, while the Social Democrats (National Hramada) of Nikolai Statkevich had 4 candidates registered. On the side of the authorities, the 63 seats for ‘Belaya Rus’ in the parliament will only increase the clamour in the movement to create a political party for the nomenklatura – where they can come together to defend their position. A conference is planned for October 2012 when they will consider transforming into a political party – they already have a working title of "the Belarusian Party of People's Unity”. However this transformation to a party has been a consistent demand since the creation of Belaya Rus in November 2007, but has been always rejected by Lukashenka who sees no reason to even marginally change the political status quo. With so many linked to one pro-nomenklatura grouping, the question has been raised about the ultimate allegiance of new parliamentarians, with concern expressed that many are ‘agents of influence’ that will be lobbying Russia’s business interests in the future. The election reinforced the role of the Liberal Democrat Party as jokers, allowed to run simply to make up the numbers and provide a partial illusion of competition. When in Gomel 36 their candidate ended up as the only contestant, the government was not prepared to let them win – and they lost to “against all”. Indeed, the LDP leader Haydukevich even came out before the election effectively saying this – giving his party a clear signal not to seek victory. Unlike all recent elections, there were no post-election protests to show the strength of the call for change in Belarus. Indeed – there were never any real plans for post-election protests – simply the opposition had not engaged the population enough to be able to seriously call for one. The general consensus was that everyone wished to save their energy for another day. This view was based on the fear that any protest would have a small scale meaningless exercise resulting in arrests, more fear and ultimately unlikely to win more support for opposition. Overall the low voter turnout seemed to confirm what experts have argued in recent times – that the mainstream population is disappointed with the authorities, but at the same time expect little from the opposition. Signs of heightened political interest, which elections usually generate in the population, were missing. Certainly, it would be difficult to attribute the low turnout recorded by independent observers in many polling stations directly to parts of the opposition calling for a boycott. Looking ahead, and in spite of the lack of major progress, the challenge for the opposition in the medium-term remains unchanged – to push for an increased space in Belarus free of the state. This would be a step in the direction of a more open Belarus, and would increase the momentum and movement towards change in the future.